A great wizard who travels the world with a mysterious bag. He is holding on to a curious book which Terra found. He instantly recognized Ventus as a fellow "world" traveler, and allowed him access to a curious book. He instantly recognized Aqua as a fellow "world" traveler, and allowed her access to a curious book. A great wizard able to manipulate time itself. He used his magic to furnish Kairi and Lea with a special training ground so they wouldn't need to rush their study of the Keyblade. Merlin's capricious nature means that he rarely stays in the same time or place for long. "Took your time, did you?" 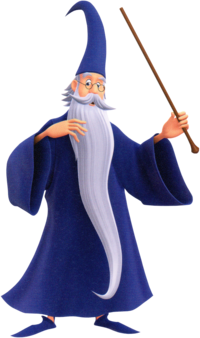 Merlin is a recurring character in the Kingdom Hearts series. He is a wizard who teaches Sora in the arts of magic when the boy appeared in Traverse Town. Merlin originated in the 1963 Disney film, The Sword in the Stone. Merlin returns to his house in Radiant Garden after some traveling, not knowing that the Winnie the Pooh book appeared along with him. Assuming that the book belongs to Merlin, Terra returns it to him; Merlin tells him its not his, but the book possesses the unique ability to bring out the hidden abilities of others. Merlin offers to hold on to the book for Terra. Some time later, Ventus chases a part Trinity Armor pass Merlin's house, annoying the wizard with the noise. Sensing Ventus also seeks to unlock his true potential, Merlin grants him access to the book. Shortly after Trinity Armor is felled, Aqua walks by; Merlin is outside, having sensed there may have been a third person. Not giving Aqua a chance to speak, Merlin informs her the book is in his house and that she may read it to her heart's content. When Aqua regains hope after being trapped in the Realm of Darkness, Merlin and Scrooge McDuck appear in a series of visions of people that she met in her journey. One day the Heartless invaded Radiant Garden, prompting Merlin to flee to Traverse Town. Finding a rundown house in the abandoned Zero District, Merlin decides to turn it into his new home. Merlin eventually welcomes Fairy Godmother as a fellow resident following the destruction of Castle of Dreams. Ten years later, both were approached by King Mickey, who asks them to assist his vassals Donald and Goofy in their journey to find another Keyblade wielder to stop the Heartless. Like the rest of the former residents of Radiant Garden, Merlin eventually forgets the true name of the world and only remembers the name of the castle: Hollow Bastion. After an entire decade, the Winnie the Pooh book begins to fall apart, to the point the cover title had faded away. Merlin leaves the book with Cid, hoping he could repair it; he was still holding onto the book for Terra. Shortly afterward, Merlin goes on a trip to explore the worlds and find out how much danger the Heartless posed. Merlin is sent by King Mickey to Traverse Town, where he sets up in the ramshackle Mystical House, along with the Fairy Godmother. Sora, Donald and Goofy can meet him as soon as they learn Fire, in order to open the door, but they must talk to him after Cid asks them to deliver the 100 Acre Wood novel to the wizard. Merlin appears in a puff of smoke to greet them, and teaches them how to properly use magic. The upper level of the house is empty, but can be used for magical training against enchanted furniture. After Sora delivers the repaired book to Merlin, he explains its special nature, but Sora is magically sucked into the secret world. Merlin will also give the heroes the Spellbinder, Dream Rod, and Dream Shield once they reach certain levels of magical skill. Merlin now lives in Hollow Bastion, which is being rebuilt. He lives in a large cottage which serves as the headquarters for the Hollow Bastion Restoration Committee. Merlin is part of the committee along with Leon, Yuffie, Aerith, and Cid. Upon reuniting with Sora, he grants Sora the Blizzard element. Merlin gives Sora his first Summon charm which unlocks Chicken Little. Merlin also retrieves the 100 Acre Wood book from Traverse Town's Zero District and places it on a shelf in his house. Later, he travels to Disney Castle with Sora, Donald, and Goofy to open up a magical door to the past. Merlin seems to have developed a rivalry with Cid, who prefers technology to magic, while Merlin prefers magic to technology. Their rivalry nearly gets out of hand when Cid calls Merlin an "old loon", and Merlin zaps Hollow Bastion's power computer, but thanks to Sora, Donald, and Goofy, the town's systems are saved. Merlin and Cid later recall that Hollow Bastion was formerly called Radiant Garden and decide to rename it to its former name. Yen Sid mentions to Mickey that Merlin and the three fairies are helping Lea to train in wielding the Keyblade by magically compressing the time needed for his training sessions. Yen Sid informs Kairi that she and Lea will be trained as Keyblade wielders under Merlin's guidance. Lea and Kairi continue with Merlin at the Secret Forest, which Merlin has enchanted to make time flow faster, allowing them to get enough training for the coming battle. Sometime later, Merlin has Chip and Dale contact Sora, Donald, and Goofy to meet him at Le Grand Bistrot after discovering that Sora is no longer on the cover of the Winnie the Pooh book. Although initially confused as to why he summoned them, Merlin instructs Sora to venture into the 100 Acre Wood to reconnect with Pooh and his friends. Upon Sora's return, Merlin tells Sora that there are always new paths between hearts for him to discover and traverse. In San Fransokyo, Dark Riku alludes to Merlin, mentioning “a certain wizard” that Sora knows whose method of time travel does not follow the same rules as that used by Xehanort's vessels in the Organization, who must cast off their bodies and travel from the past as hearts. Merlin is an elderly man with pale skin and thin arms and legs. His nose is a bit large and his black eyes are rather small and close-set. He wears spectacles with circular lenses. He seems to be balding and has short, white hair on the sides and back of his head. He also has bushy eyebrows, a walrus mustache, and a long, floor-length beard, all of which are white. Merlin dresses in a sky blue cloak that stops just above his ankles and has large, hanging sleeves. He wears pointed slippers and a tall, floppy, conical hat, both of which are the same sky blue color as his cloak. Merlin's wand is a very long, featureless, brown rod with a small bump on one end. Merlin appears to be calm and decisive. In spite of his old age, he has an active nature. Merlin is nice and seems to be caring to the ones close to him. However, he can be easily annoyed, especially when people insult his talent for magic, and he will not hesitate to physically retaliate. Merlin's first appearance was in the 1963 film, The Sword in the Stone. In the film, Merlin teaches the young King Arthur some life lessons and prepares him for a life as the ruler of England. He also has a rivalry with Madam Mim, but this rivalry has yet to manifest in Kingdom Hearts. Merlin also has a pet owl named Archimedes, who has not yet been seen in Kingdom Hearts, although his birdhouse is seen hanging in Merlin's house in Kingdom Hearts and Kingdom Hearts II. Also, Archimedes can be heard calling outside of Merlin's house in Kingdom Hearts.